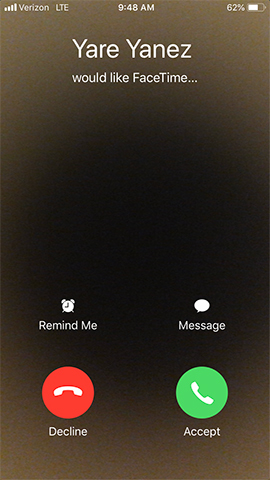 The FaceTime app must be turned on to place or accept a FaceTime call. For assistance turning on FaceTime, refer to Turn FaceTime On / Off. From the Home screen, tap FaceTime. FaceTime can also be accessed from Phone or Contacts. 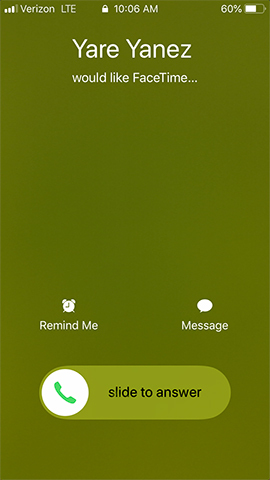 Tap the Plus symbol + (upper-right) to access Contacts. If not available in Contacts, enter the name, email address or number then tap Search. To end the Video FaceTime session, tap the End button (red phone symbol). 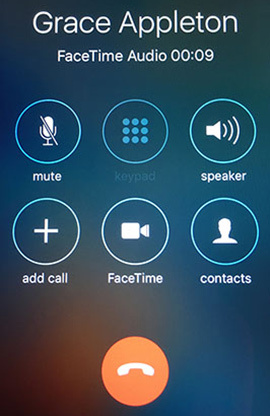 To end the Audio FaceTime session, tap the End button (red phone symbol). For additional FaceTime support, refer to this Apple article. Option available when your phone is locked. Option available when your phone is unlocked. To use Group FaceTime video calls, you need an iPhone 6s or later with iOS 12.1. Earlier phone models that support iOS 12.1 can join Group FaceTime as audio participants. To start the FaceTime call, tap Audio or Video.